Use the Liberty 1-3/8 in. 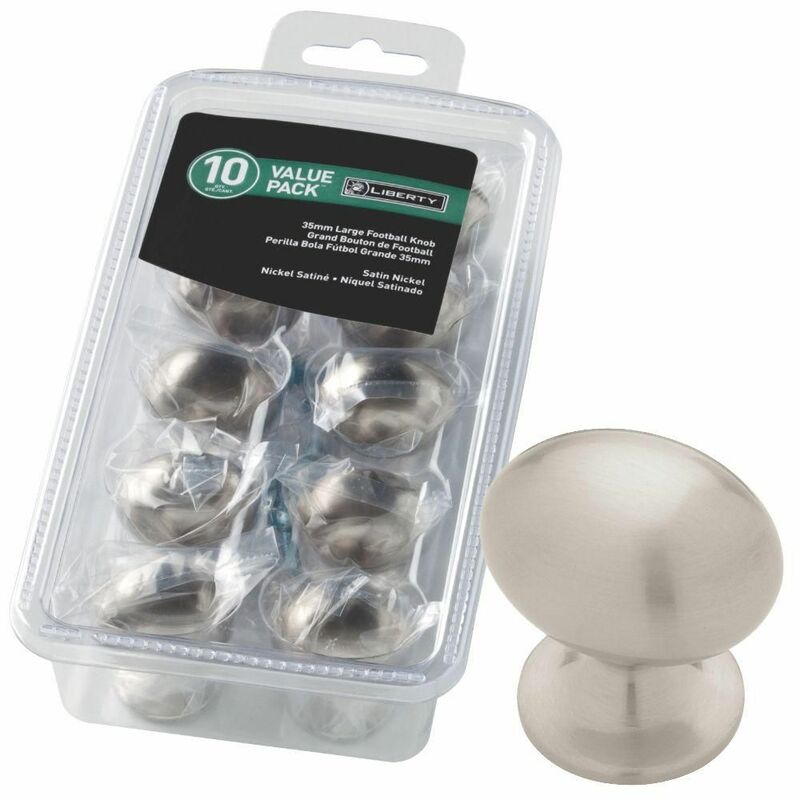 Satin Nickel Large Football Knob (10-pack) to add a finishing touch to your cabinets. Featuring a modern design and satin nickel finish, this knob will stand out in any decor. The knobs include 8-32 in. x 1 in. machine screws. Update your cabinetry with the Liberty 1-1/2 in. Concave Round Knob. The satin nickel finish offers a stylish traditional look. The zinc die cast base material provides durability. Mounting hardware included for easy installation. 1-3/8 Large Football Knob, 10 per pkg Use the Liberty 1-3/8 in. Satin Nickel Large Football Knob (10-pack) to add a finishing touch to your cabinets. Featuring a modern design and satin nickel finish, this knob will stand out in any decor. The knobs include 8-32 in. x 1 in. machine screws. 1-3/8 Large Football Knob, 10 per pkg is rated 4.8 out of 5 by 58. Rated 5 out of 5 by HomeDepotCustomer from These cabinet knobs are of high quality with regards to... These cabinet knobs are of high quality with regards to their weight and brushed nickel finish. They enhanced our dark cabinets in our master bath.